The Biped is out and about, per usual, so allow me to reply to your question directly, as well as share some thoughts about that hot mess of boneless fur smeared across your davenport. I have no idea exactly how old I am. The early days are a blur. As best I can recall, I was kidnapped about 2 years ago from the orphanage, and relocated to my current address here in the City by the Bay. Obviously, no ransom was paid on my behalf, so I’ve remained here ever since. I have no complaints, although “room for improvement” would be a fair way to characterize my current environment. The Biped comes and goes with a degree of impunity I find utterly capricious, and a three-story walk up has frankly, become a bit tiresome. But all in all, I suppose things could be worse. Which brings me to matter of the Freak Show on your sofa. What the hell am I looking at exactly? Has this creature escaped from the circus? Or, are you suggesting that all canines are literally “assembled” from the outset, and not actually born? If so, that would explain a great many abnormalities on display at the Dog Park. Not to mention the Frankensteined creature down the hall with the head of Pit Bull and the body of a Dachshund. Is he really the product of some ill-advised coupling, as I’ve always assumed, or is he the end result of another Biped who simply couldn’t be bothered to read the instructions? Regardless, your suggestion that I bear some resemblance to this mutant can not go unanswered. Please, allow me to point out a few differences, with a tasteful representation of your’s truly as a visual side-by-side comparison. First of all, notice the legs. See how they originate from the shoulders and hips? See how they extend downward toward the floor? That’s normal. 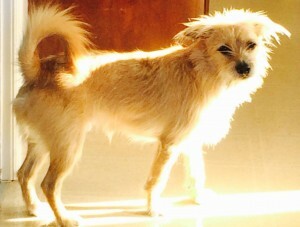 Look at the tail. See how it curls up and around, arcing downward toward the spine? Also normal. See how my torso narrows toward my flanks? See how the chest expands just below my neck? Totally normal. Finally, notice my head, cleverly located between two ears, and perched logically above the rest of me. That’s where a head should be. Not twisted up like a corkscrew and jammed into the cushions. 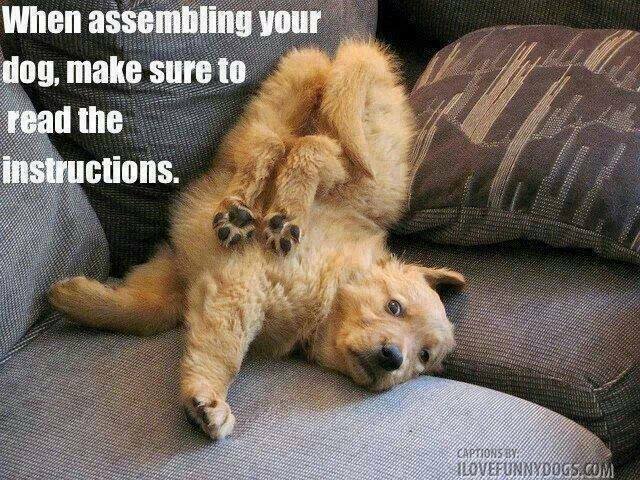 Clearly, this is how a dog should be assembled. And while I suppose it’s possible to find some passing similarity between myself and that mangled heap you suggest I resemble, I must say, without ego or hubris, that I just don’t see it. PS The Biped wishes to remind you that tickets for his appearance in Seattle are now available to The Great Unwashed. And for those who are wondering, no – I will not be in attendance. I get enough of His Majesty’s smack here at home.